We have a new department here at C L Promotions which we are very excited about. It's an online shop where you can order your new Environmentally friendly Eco products, and then pay with your credit card and receive your order next day guaranteed. 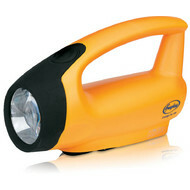 The Freeplay Kito LED lantern underscores the sustainability and power independence of the Freeplay illumination range. Incorporating failsafe Freeplay wind-up technology, the Kito LED lantern provides excellent brightness and shine time, all without the need for replaceable batteries or conventional wall charge - Powered by You. Mother Earth needs saving and it's up to us to save the environment. For more information about our Wind Up Torch and our other Environmentally friendly Eco products by linking to our other website - please click here.